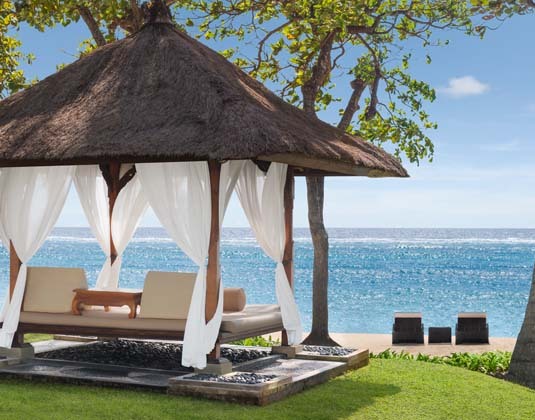 A Luxury collection resort clustered around sparkling lagoons, a free form swimming pool and 7 acres of tropical gardens leading to Nusa Dua beach, The Laguna Resort offers discerning travellers a tranquil haven of relaxed luxury. All rooms reflect a contemporary Balinese style with polished teak floors, hand-woven carpets and butler service to ensure a matchless experience. You'll find it hard to tear yourself away from the beach with the endless ocean views. In deluxe garden view rooms with air-conditioning, oversized corner bath/shower, DVD player, mini bar, complimentary tea and coffee available from the butler, safe and 24 hour on call butler service. deluxe lagoon view rooms, deluxe lagoon access rooms, deluxe studio lagoon access studios, ocean view suites. 01 Oct-24 Dec 19 and 04 Jan-31 Mar 20 if you book at least 90 days before arrival. 01 Oct-24 Dec 19 and 04 Jan-31 Mar 20 if you book at least 60 days before arrival. 15 Jul-30 Sep 19 if you book at least 90 days befire arrival..
01 Apr 19-31 Mar 20 receive one breakfast served in room per stay and honeymoon gift. 01 Apr 19-31 Mar 20 if you stay at least 10 nights and stay in a Executive Suite or a Villa receive one buffet dinner at Banyubiru and one FREE 60 minute Balinese massage for two people. Meal is based on food only. 01 Apr 19-31 Mar 20 if you stay at least 7 nights and stay in an Executive Suite or a Villa receive one FREE 60 minute Balinese massage for two people.